I find the Meming of Life blog by Dale McGowan a great read. He's the editor and author of a number of books on atheism and secular parenting in particular. 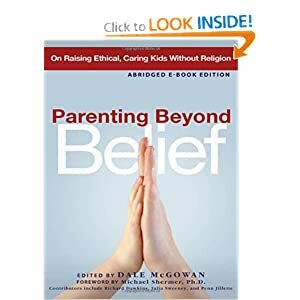 I am a big fan of the book Parenting Beyond Belief, in which various different atheist and agnostic people discuss how they addressed issues confronting secular parents. In particular I loved how the book presents different options and opinions, sometimes conflicting ones, and assumes the readers are perfectly capable of deciding what will work best for them. I really loved this recent post. It's an answer to a reader's question about the comfort that religion can bring, and how secular parents can replace this in their child's lives. The answer suggested is real people, real relationships. The support networks of friends and family. I've certainly found that, through my recent crisis. My friends and family have gotten me through it. It has been difficult, but had I been alone, it would have been impossible. Thank you, dearest mother, sister and wider circle of support. I love you all. You are where I draw my strength and inspiration from, and I know that you are there for my daughter as well, and will be into the future. No matter what life throws at us, we will be fine, because we have you.